SEP 2018. 永續、修復、再利用 舊旅店妙手回春. We are featured in Business Today Taiwan! JUL 2018. Picupi wrote about us in Chinese! Thank you Julien for your visit. JUN 2018. Barcelona Slow Tourism featured us in 7 Barcelona best hotels and places to stay for the eco-friendly traveler. We are happy that more and more places start caring properly about the impact of their activity. JUN 2018. Vida Verde is a radio program about sustainabilityby the Spanish National TV and radio. They interviewed us regarding urban mass tourism and eco-innovation. Jump to our interview here (in Spanish). MAR 2018. Us on the Venue Report: A new form of accommodation that truly connects visitors with locals and the city. SEP 2017. Matthew Anello interviews Petz for his show Zest for Life on Barcelona City FM radio. JUL 2017. Demano interviewed Petz on their blog. […] What is the difference between yök Casa + Cultura and other apartments in Barcelona? JUL 2017. French Architecture and Transition Town Magazine Ecologik did a feature about us! ABR 2017. Das Hotel von morgen: Social Hub und Holistic Experiences by Andreas Reiter from the ZTB ZUKUNFTSBÜRO. ABR 2017. More than an eco-friendly place to stay by Cristina, La Ecoturista. FEB 2017. Top spots in Passeig de Sant Joan by Isabelle Kliger for Scandinavian Traveler (SAS). JAN 2017. We are on French TV! Odile and Luca from the travel program “City Two” by Voyage stayed with us. Video not publically viewable yet, sorry! Un Hébergement design et totalement écologique, et surtout un accueil 100% barcelonais chez Petz et María. NOV 2016. Silke Wichert from the Süddeutsche Zeitung visited us. JUL 2016. Slow Barcelona. A guide to take it easy in Barcelona by Sunday Times Travel. JUL 2016. Barcelona’s Best Roof Terraces Writer Isabelle Kliger thinks we have one of them! JUN 2016. “Lëtzebuerger an der Welt“, listen to an interview with Petz by RTL Radio Luxembourg. JUN 2016. “yök, la Barcelona de verdad“. An interview with Mari and Petz by MAASÅI MAGAZINE. MAY 2016. Read about us on Urlaubsarchitectur! APR 2016. Chiara Saraceno wrote about us in AD Spazio! FEB 2016. María Muñoz interviewed us for the magazine METAL. OCT 2015. Robert from Pretty Hotels thinks we are a pretty hotel, yay! Check out his photos too, they are very nice. SEP 2015. Fantastic Spot. yök by Raül de Tena from Fantastic Plastic Magazine. From the same mag is our very first press coverage! SEP 2015. YÖK CASA + CULTURA BARCELONA: DESIGNER APARTMENTS IN EL BORNE by Bianca for Your Little Black Book. SEP 2015. Emma wrote about us for ELLE Decoration, after her stay at yök. JUL 2015. Styling with Delica and a rooftop dinner By DESIREE for Vosgesparis. JUL 2015. Spanish Design: yök Casa + Cultura Barcelona via the Happy Interior Blog! JUL 2015. Urlaub mal anders: Design-Hostels in Barcelona By Igor Josif for Roombeez, Otto. JUL 2015. Read about us in Finnish! By Susanna Vento, with photos! JUL 2015. Read about us in design i sentrum! JUN 2015. Thanks Vincent Degroote for featuring us in the Venuez Magazine! MAY 2015. Héctor Llanos writes about us for El Huffington Post: Diseño sostenible para una nueva forma de alojarse en Barcelona. MAY 2015. 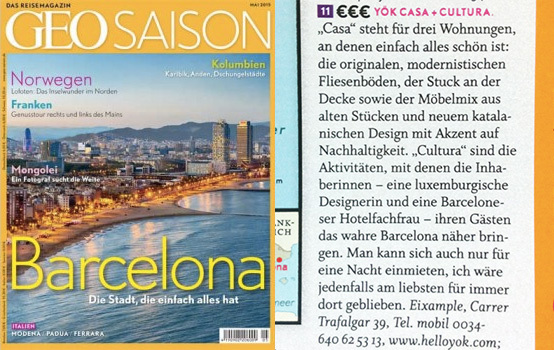 We are featured in the GEO Saison Reisemagazin! MAY 2015. yök in hippe sippe: Unser Tipp für Stadtentdecker und Familien mit größeren Kindern. ABR 2015. Exclusive Barcelona Eco Travel Guide by Premium Europe. APR 2015. Inspector Hotelowy wrote about us in Polish! FEB 2015. One fine day in Barcelona, Smart Magazine stops by yök! FEB 2015. “The real Barcelona exists”. Smart Magazine interviews Petz Scholtus. FEB 2015. Uma hospedagem sustentável e autêntica in Casa Vogue, Brasil. JAN 2015. Gorgeous Catalan building renovated into an eco-friendly hostel in Barcelona. By Lidija Grozdanic for Inhabitat. JAN 2015. Thank you Brian Gallagher for “Yök Casa + Cultura, Ecoturismo Urbano” in B-Guided! JAN 2015. Modernismo Ecológico in El Periódico. JAN 2015. yök, a set of apartments introduces a new accommodation concept for tourists visiting Barcelona in Attitude. […] It’s on the terrace with a breathtaking overview of Barcelona that the hosts develop activities with the guests; these focus on raising awareness for issues of sustainable tourism, a subject particularly relevant in a city struggling to cope with the consequences of mass tourism. DIC 2014. yök amongst THE BEST HOTELS OF 2014 by Petite Passport. DEC 2014. Bamboo Magazine in Brasil wrote about us! Thank you Camila Régis. NOV 2014. Here is the video of Divendres magazine by TV3. Go to minute 01:44:00 to see what they say about us (in Catalan). NOV 2014.“ECO LOCATION Architectural heritage meets modern sustainability principles at thoughtful Barcelona B&B” by Rob Wilkes for We Heart. […] At yök, a commitment to the principles of eco design (reuse, recycle, reduce, restore, respect) is married to a reverence for the architectural features of the properties – these include decorative high ceilings, mosaic tiles, etched glass and sliding wooden doors. Cultura comes from a programme of events on that amazing roof space, which are organised to bring together locals and foreign tourists to help ensure their guests’ visit to the city doesn’t have to take place in a “tourist bubble”. OCT 2014.“L’appartamento Spagnolo” by Stefano Lento for Living Magazine in Italy. OCT 2014. Mari and Petz in an interview by Gabriela from Barcelonogy. OCT 2014. We’re featured in the Luxembourgish architecture magazine Archiduc #9. OCT 2014. Ellen Himelfarb wrote about us for wallpaper*. OCT 2014. Ida from When in Barcelona writes about us in an article for the Swedish Metro newspaper. OCT 2014. Yök Casa + Cultura by Lady San Pedro for the Miniguide. OCT 2014. Local Barcelona designers foster elegant tourism in yök Casa + Cultura. SEP 2014. yök en SOGOODSOCUTE. SEP 2014. yök Casa + Cultura. B&B de turismo ecológico en Barcelona. Via diarioDESIGN. MAY 2014. Kirsten van Dam from Out of Office wrote about us, and calls us a niche-place-to-stay! We like it, thank you. Most designers begin a remodel by choosing what to trash. Petz Scholtus chose what to collect from the trash to be upcycled (recycled for a higher use). When Scholtus bought her Barcelona apartment in 2006 it had no plumbing nor electricity, though it had some choice trash, like the long piece of glass she stopped her construction crew from throwing away. With two sawhorses (recovered from the street) for legs, it became her dining room table. MAR 2009. To know more about the R3project that inspired yök, please read Penelope Green’s article in the NYTimes!